Film critics often get it in the neck for overanalysing or expecting too much from films which, for some people, are designed only to entertain. While expecting nothing other than fun from the movies will prevent one from properly exploring all that the medium has to offer, it is also true that reviewers have to keep their feet on the ground. Every so often we have to defend a film mainly because we enjoyed ourselves - and, ironically, the simplest pleasures are often the hardest to explain. The Pirates! In An Adventure With Scientists! is a good example of this phenomenon. On the surface there is nothing especially remarkable about it, either in the quality of the animation we have come to expect from Aardman, or in the conventional nature of its story. If one was in a bad mood, it would not take too long to dismantle the film, with withering comments about it not being first-rate Aardman. But the fact is that, after seeing this film, you're very unlikely to be in a bad mood. The Pirates! (as it will hereafter be called) marks an interesting turning point in Aardman's history, at least from a technical viewpoint. Along with their previous digimation, Arthur Christmas, it marks the beginning of a partnership with Sony Pictures Animation, who three years ago produced the hilariously surreal Cloudy with a Chance of Meatballs. 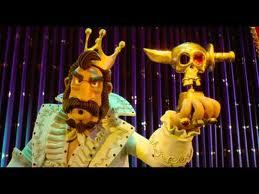 This is significant due to the combination of traditional stop-motion and CG effects needed to bring the film to life. When Aardman was creating Flushed Away, working in partnership with Dreamworks, a decision was taken early on to do the entire film in digimation, on account of how difficult water is to film and the damage it can do to plasticene. But for all its moments of charm, Flushed Away felt like Dreamworks had run roughshod over Aardman's creativity, reducing true genius into something a lot more ordinary. Being set primarily at sea, The Pirates! involves a large amount of visual effects to create the water and the skyline around the stop-motion figures. 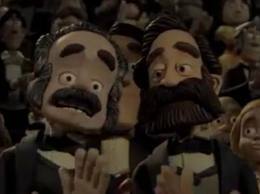 But while Aardman and Dreamworks were constantly at loggerheads, on this occasion the effects blend beautifully, with the hand-crafted characters taking centre stage even in the most elaborate set-pieces. 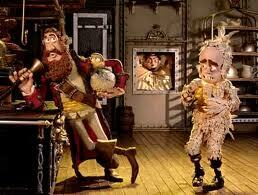 Aardman's strength has always been in stop-motion, and here they are allowed to work to their strengths. As always with Aardman, the devil is in the detail. Their films are made by people who love cinema, pouring in references to films from their formative years to enrich the finished product. You won't spot all the sight gags, quirks and puns the first time round, but more importantly the story and characters are enjoyable enough to make you want to revisit them. The hearty laughs that do stick in one's mind, whether it's the fish-in-a-hat gag or the ship leaving red markers on the map, are almost like teasers in themselves, part of a gift that just keeps on giving. The film has great set-pieces which rival anything in either Chicken Run (Peter Lord's previous film) or Wallace & Gromit: The Curse of the Were-Rabbit. The rooftop chase, in which Charles Darwin attempts to steal the last living dodo, builds like an old-fashioned 1980s action set-piece, using the full spread of the house to maximum effect. The sequence of the bath careering down the stairs is like an extended version of the boulder chase in Raiders of the Lost Ark, and there is a brief nod to Jurassic Park as the bath leaps majestically through an enormous skeleton. While Curse of the Were-Rabbit was rooted in horror movies, paying homage to Dr. Jekyll & Mr. Hyde, Hammer movies and An American Werewolf in London, The Pirates! is grounded in the old-fashioned adventure of Errol Flynn and Richard Lester's The Three Musketeers. The action sequences feel like they have been choreographed to allow for the fewest number of edits, with Lord and his animators understanding that audiences are often more impressed by the scale of a battle than the pace as which it appears to unfold. The release of The Pirates! internationally has not been without mishap. Aardman received a complaint from Lepra Health in Action, requesting that a scene of a leper's arm falling off be removed for misrepresenting victims of leprosy. More worryingly, in America the title was changed to The Pirates! Band of Misfits!. While film titles are commonly changed, this is symptomatic of marketers having low opinions of a film's potential audience. It is ludicrous to believe that the world 'scientist' would put Americans off seeing the film. It certainly doesn't change the relatively heroic role accorded to Charles Darwin. 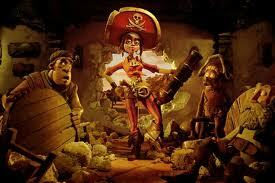 The characters in The Pirates! 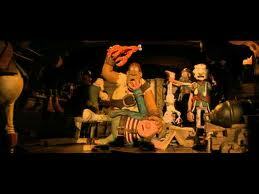 continue the Aardman tradition created by Nick Park of the inept but extremely confident protagonist. 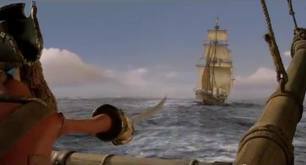 The Pirate Captain is fully aware of the motley nature of his crew, observing in one of the film's best sight gags that some of his crew are just "fish that I've dressed up in a hat." 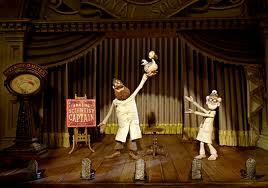 But he is as confident in his ability to plunder as Wallace is in his inventions. Martin Freeman's first mate acts as a Gromit-like foil, trying to do the right thing while harbouring a sense of duty towards his oldest friend. 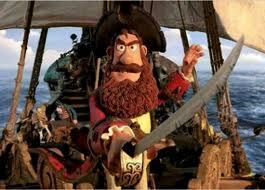 The biggest criticism of The Pirates! has been its storyline. Because it combines two of Gideon Dafoe's children's books, there is a lot of plot to get through in 90-odd minutes. And because the film is not a direct pastiche like Curse of the Were-Rabbit, it doesn't have quite as rigid a structure as one might like. But some critics would go further and claim that its emotional arc is too predictable, with our heroes jumping through narrative hoops without offering anything new. There's an old adage that the difference between a convention and a cliché is the emotional response that surrounds it: if we are enjoying ourselves, it's a convention, and if not, it's a cliché. The fact is, even if The Pirates! is in familiar waters, it is funnier and more lovingly crafted than any of the similar stories which clog up our multiplexes in the summer season. We should not take Aardman's craftsmanship for granted, and must be willing to promote this genuine passion for craft almost in spite of its familiar elements. The film passes the acid test of any comedy, never letting up in its ability to make you laugh. The running gags surrounding the Pirate Captain's boarding parties are very well thought-out, as are the crew's disguises and the numerous map scenes. The more whimsical jokes, involving baby clothes, baboon's kidneys and ham night, are all first-rate Aardman, and Peter Lord's comic timing is on a par with Nick Park's in judging where and when to play every single gag. 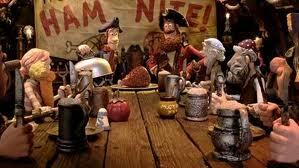 The cast of The Pirates! is also of a high standard. 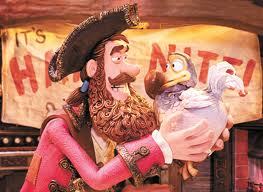 Hugh Grant, in his first animated role, handles the Pirate Captain with such aplomb that afterwards you won't be able to imagine him without that beard. Imelda Staunton is terrific as Queen Victoria, with a performance that makes her character in Harry Potter and the Order of the Phoenix look tame by comparison. David Tennant and Martin Freeman provide great support in their respective roles, with the former's geeky excitability offsetting the latter's world-weariness. 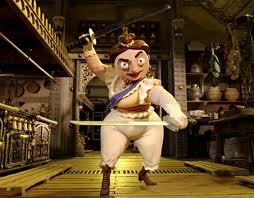 And as for Brian Blessed's cameo... suffice to say, no-one else could have played that part. The Pirates! In An Adventure With Scientists! 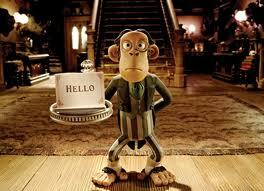 is a really great family film which will hold up to repeat viewing every bit as well as Aardman's previous offerings. Peter Lord directs superbly, handling a talented cast with near-perfect measure and blending the stop-motion and CGI very well. While it's not quite perfect, it bodes well for the future of Aardman, with or without Wallace and Gromit. Thoroughly recommended.